An advocacy group, named the National Center for Reason and Justice (NCRJ), has written a response to The Witch-Hunt Narrative. Their response mischaracterizes the book in several important ways that are explained on this page. Their response also ignores almost all of the specific cases and evidence in the book. As it turns out, many of those cases are “sponsored” by NCRJ, meaning that the organization has been fundraising and advocating on behalf of the defendants in these cases. The book agrees with NCRJ’s position on the Baran case (pp. 126-28). But there are eight cases discussed in the book, sponsored by NCRJ, in which there was significant evidence of guilt. For readers interested in knowing more about that evidence, see the following passages in The Witch-Hunt Narrative: Kellers (pp. 144-47), Smith/Allen (pp. 149-50), Friedman (pp. 130-33), Fuster (pp. 283-354), Halsey (pp. 147-49), Krivacska (pp. 393-94), Malcom (pp. 134-37), and Rouse (pp. 394-400). The Witch-Hunt Narrative is featured today on the front of the Science section of the New York Times. Emily Bazelon of Slate wrote the review. 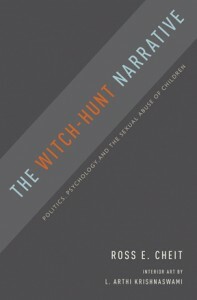 We appreciate Ms. Bazelon’s recognition that The Witch-Hunt Narrative is an important book and we are delighted to be placed in the middle of the discussion of many timely issues about our social and legal responses to the sexual abuse of children.